Cavity dimensions: 3¼" diameter x 1¼" deep Made of heavy cast aluminum which provides superior baking performance. Baked goods rise evenly, and cook uniformly thanks to the excellent conduction of the heavy walls. A special heat relfective exterior and premium nonstick surface assures perfect results. Pan is wonderful for bread, molded desserts and savory dishes, as well as cake. Pan has a total batter capacity of 3 cups or approximately ½ cup in each cavity. 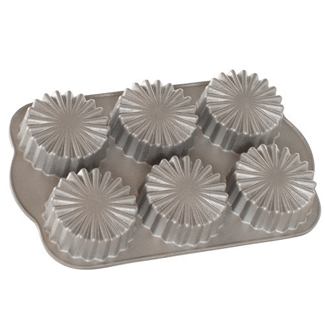 Made of heavy cast aluminum which provides superior baking performance. Baked goods rise evenly, and cook uniformly thanks to the excellent conduction of the heavy walls. A special heat relfective exterior and premium nonstick surface assures perfect results. Pan is wonderful for bread, molded desserts and savory dishes, as well as cake. Pan has a total batter capacity of 3 cups or approximately ½ cup in each cavity.